I’m new to this. I’m in the medical field, and I need a hobby. So I decided to build a drone. A big drone. I’m going to build an octocopter that can carry me. If you have some suggestions, please let me know. This size machine has been built and is working toward commercial operation. I’m just looking for one I can call an experimental and fly in it on clear days. The SureFly has been my inspiration. It looks as if they are using a BMW range extender engine to power the system as a hybrid machine. The SureFly also has a small battery pack that gives the craft 5 min of flying time if there is an engine failure. They want to sell this for about 200K. I can’t afford that, besides, it would be more fun to build it. As I work to learn more about this, I recognize that I have multiple knowledge deficits. My hope is that I can come to this forum and ask some questions. I’m not looking for you to do the math for me, but perhaps give insight on where to go to learn specific skills sets and areas of knowledge. For example, I’m uncertain of the amount of power I need to operate the motors. I’m looking at the highest powered brushless motors I can find and I can see multiple energy specifications listed. But I’m not certain which translates into determining the max power I need for 8 motors on this machine. The range extender engine provides 25 kW. I need to better understand how to make this calculations and how to convert the power from the range extender to the motors without blowing out any electronics. As I said, I’m not looking for anyone to do my math, just perhaps direct me to an area where I can learn what I need to know. Specifically, which specification listed on motors will provide me with the numbers I need to know to calculate if I have enough power with the BMW motor. I suspect that if SureFly can power with the BMW motor, I should be able to do the same. Furthermore, while I am looking at numerous brushless motors, does anyone have any suggestions for which brushless motors might be the best for this project? I’m certain I will have many other questions. I appreciate any assistance and moral support I can obtain. 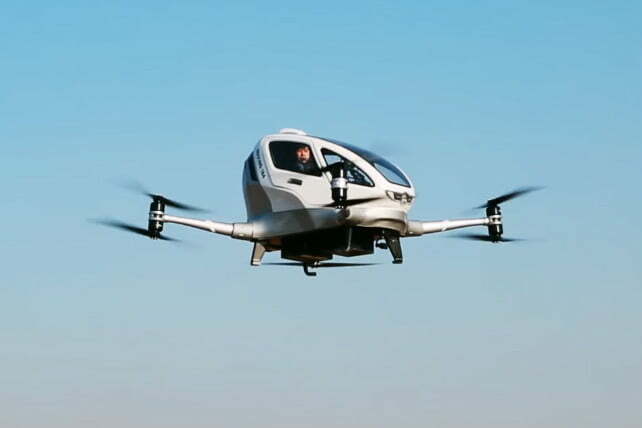 that can fly about an hour , and it is fully electric. First of all, you need to calculate your thrust, that in your case is the sum of the thrust of all your motors at the 50% of throttle. The thing is the main computer onboard yo will use , and the software. you can learn more about bateries on the internet and doing your first small low cost drone. in that situation you no longer need a RC transmiter to control you aircraft. Wowy! Have you ever flown a drone before? I would as a first step fly and build something very small as this is a very complicated and dangerous project! But I am excited to see what you make. Thanks so much for all of the input. There is so much to learn, but I'm having fun doing it. When I actually start building, I will post the details and photos. Right now, my first step is building a small quad-copter. I started that last week. Figuring the power system, using a hybrid engine continues to challenge me. I played with one a while back, but nothing more than a toy. I'm building a quad-copter from a kit right now and learning about the components. But making it on the larger scale, that seems to be the challenge. For those of you who are following this discussion, here is a critical piece of information I received today. "The 10218 with 30.5” triple props is capable of lifting 57.28 pounds at full throttle on a 53.8V input and draws 6.2kW per motor. The 10218 with 30.5 double props can lift 53.09 pounds at full power (on 53.8V), but only draws 4.7kW. The total lifting power of these motors and propellers is 424lbs and 458lbs for the double and triples respectively. Total power consumption for both set-ups is 37.6kW and 49.6kW." Right now, I'm looking for the power source. I was starting my search with the BMW W20 REx Engine. It looks like it only makes 23.3 kW. I will need 2 engines or a different power source..
please check or out large 50kw motor, 50x12 prop and ESC combos for large copters., we also carry large 3 blade props but the cost is prohibitive for small projects. I like the ability to have a longer flight time with an engine as well as the ability to refuel and return to flight. Besides, finding that correct balance between engine and lift is a challenging concept. Last night I was looking at microturbine auxiliary power units as well as used aircraft APUs. This will be an interesting build. Thanks for the info. These are interesting motors. also able to special order 15-20kw hydrogen fuel cell kits with hiy pressure tank alternative to a petrol generator can be much lighter solution for a range extender.